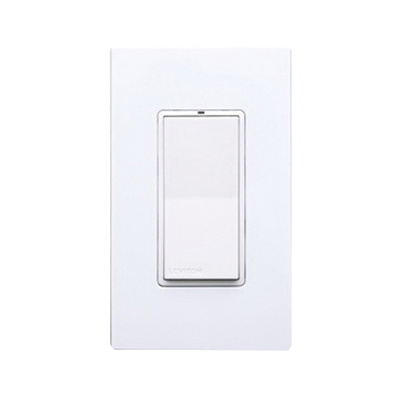 Leviton LevNet RF™ Decora® 1-Pole Rocker wall switch receiver with zero-cross relay, features high inrush stability arcing design that is ideal for use with all commercial ballasts. It has voltage rating of 20-230-277-Volt AC and current rating of 10-Amps. It measures 1.66-Inch x 1.34-Inch. Switch receiver with rocker, momentary and toggle action, controls light from 50 - 150-ft range. It uses 800-Watt incandescent lamp at 120-Volts with 1200 VA at 120-Volts, 2700 VA at 277-Volts fluorescent ballasts. It requires 400-Watt LED at 120-Volts with 1/4 hp motor load at 120-Volts. Receiver withstands temperature rating of 0 to 50 deg C. It is suitable for retrofit applications where incandescent, fluorescent and LED lighting controls are important.